You must be a member of the Nuremberg Book Group to attend this activity. Would you like to join this group? 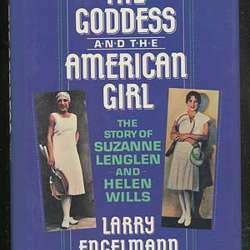 "Better known and more admired in the Protected content and '30s than any politician, movie star, or royal family member, Suzanne Lenglen, lionized by Frenchmen as "The Goddess," and Helen Wills, called "Queen Helen" or simply "The American Girl," revolutionized tennis with their power and grace and beauty, and in the process virtually invented the concept of celebrity athlete. This superb dual biography--the first of either player to appear in English--follows their careers from the time they first set foot on a tennis court through their ascent and descent on the international circuit. Suzanne Lenglen was introduced to the game at age eleven by her father, an overzealous French businessman who is credited with adapting tennis to women's play. "Papa" Lenglen trained his daughter rigorously and throughout her career was her mentor and coach, providing sips of cognac at key moments and watching her every move with a stern parental eye. Lenglen, known by her trademark white ermine cape and diamond-studded headband, became the first non-English-speaking woman to win the Wimbledon singles championship--a title she held six times between Protected content 1925. But to her fellow Frenchmen she was more than a great athlete: she was a symbol of resurgent French pride after the costly bloodshed of World War I, a national hero on the level of Joan of Arc." All Albatross members who have read the book are welcome to join us.